Do you long to know the truth in the midst of this deluded world? I believe our greatest anti-dote to deception is to be filled with God’s living Word, which is the Truth. Val Stares, the Director of Above Rubies in Australia has spent hours digging for the treasures of what God says about Truth. You can join with her in her treasure hunt as she takes you from A to Z, finding what God says about truth for every letter of the alphabet. By the time you get to the end you will be RICHLY filled. There are also heartfelt prayers and poems throughout the book. You can also use it with your children as a teaching manual about Truth, or take on the of the letters of the alphabet and read and discuss the Scriptures at your Family Devotions. 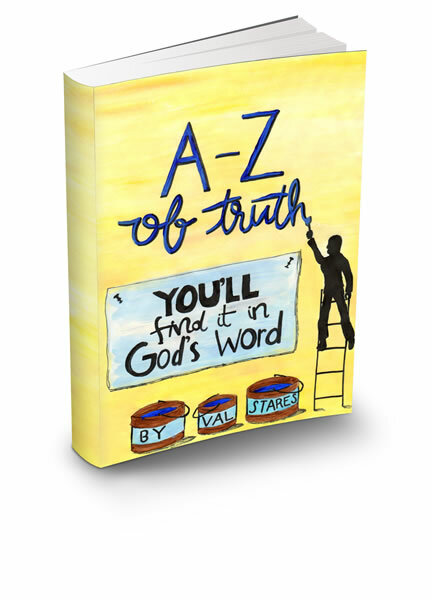 Order your copy of the A-Z of TRUTH Ebook TODAY! Order your Electronic Book (E-book) file(s) today. Examine the contents for a full 30 days. If after examining the MP3 you feel that this material is defective, call us and tell us you’d like to receive a replacement E-book file. We’ll send you a new Electronic Book (E-book) file(s) right away. Click the button below to add the A-Z for Truth - EB00k - by Val Stares to your wish list.